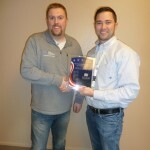 Washington Patriot Construction presented BME with their Subcontractor of the Year Award. The award is voted on by all employees of WPC. BME supported WPC on the Arresting Gear project at NAS Whidbey Island and the BEQ 1001/1044 project at Puget Sound Naval Shipyard. BME enjoys a strong relationship with WPC and looks forward to more partnering opportunities in the future.